It's been a while since I was able to type a post with both hands! I've usually got one arm occupied with a sleeping, squishy, fabulous-smelling baby! So I apologize if I'm a little extra chatty! People that know me fairly well know that I have a serious obsession with all things cupcake! 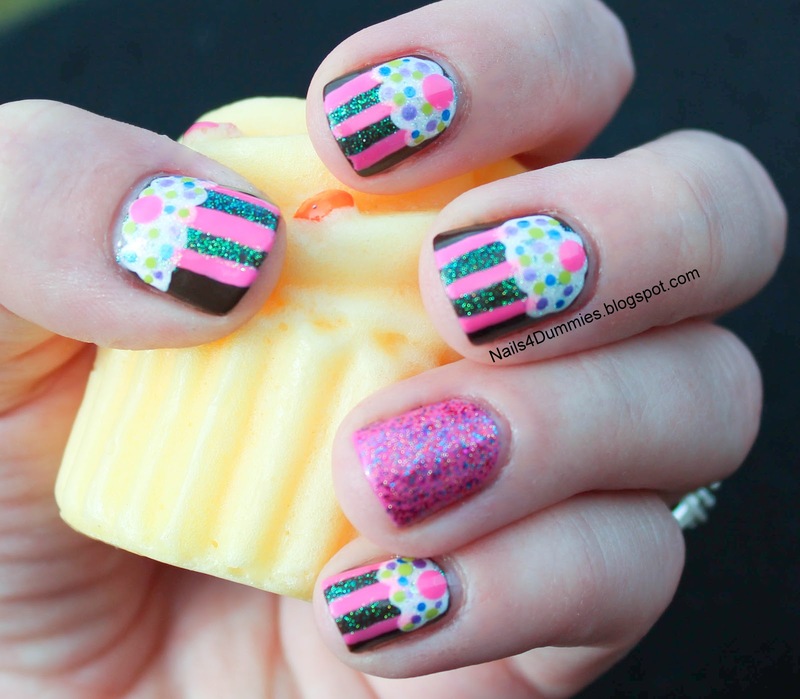 All of the baby clothes and blankets that I got for my baby shower was cupcake-themed and people text me cupcake related stuff and, oh, yeah - I LOVE eating cupcakes too! For some reason they taste better than cake? I think it has something to do with the cake-to-frosting ratio! :) My mom always gets me things like cupcake candles and bath bombs and my husband got me this awesome pair of cupcake jammy pants that I haven't been able to wear because it seems like I'm always roasting hot! 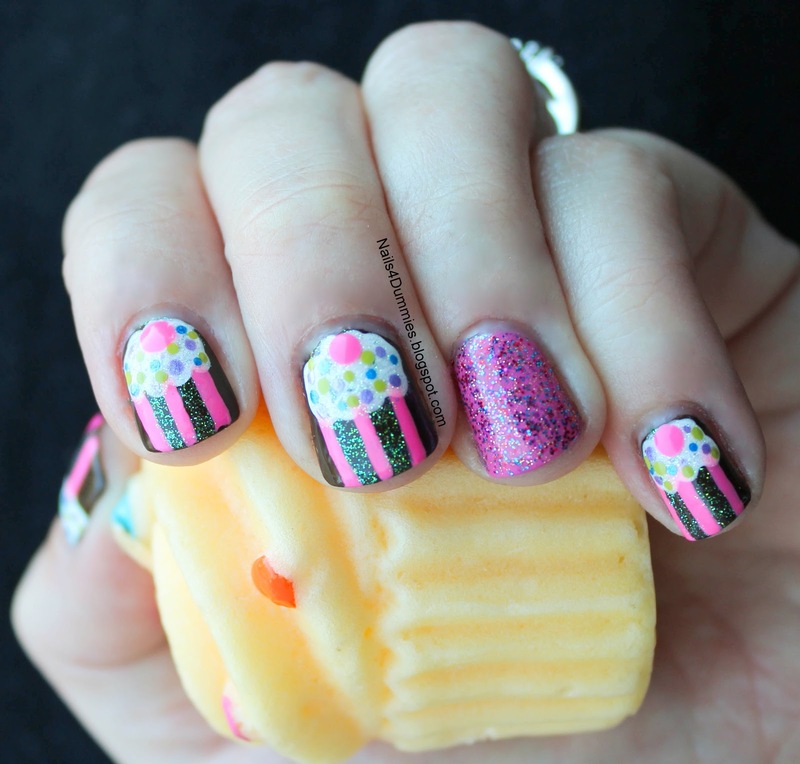 Every time I see cupcake nails I drool, literally. It's gross and messy and I really need to stop. XD I'm so hilarious today! I finally gave them a try and I'm fairly pleased with how they turned out for being so new to freehand art and nail art in general! I actually used acrylic paint this time around rather than polish and it was MUCH easier! It didn't get "goopy" as quickly and if you mess up you can just wash it off and start over without having to re-polish the whole nail! I started off with a base color of Julep Olivia and an accent finger of OPI If You Moust You Moust and a couple of coats of NYC Big City Dazzle to add some schparkle! (yes, I realize that isn't how it's spelled, I like to make up words!) 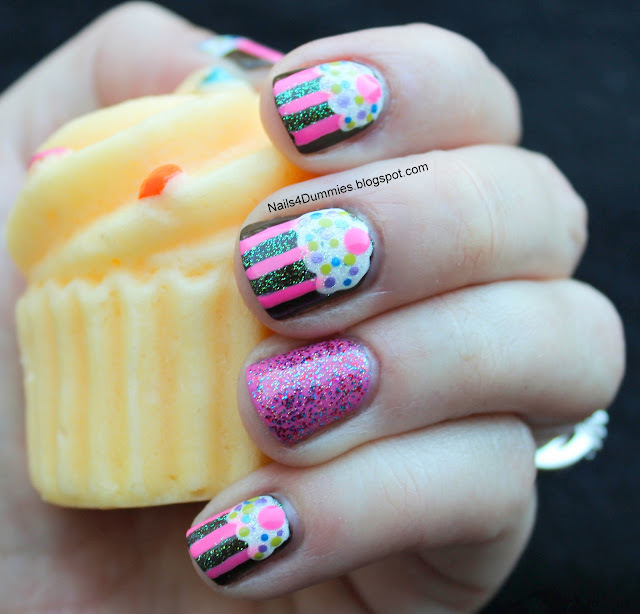 Then I painted on the cuppy-cakes and once that was dry I added a healthy dollop of topcoat! Also, PLEASE, enter our contest, The Lazy 15 beginning Nov 2nd, it's going to be a lot of fun! For more deets, check HERE! So lovely! I love cupcake nails gorgeous and delicious. Nom. Thanks Jazz! I hope you're all ready for the challenge! Game on! Awww, thank you, I had a lot of fun with this post! Isn't that little girl adorable? If you haven't seen that moveie you really should!